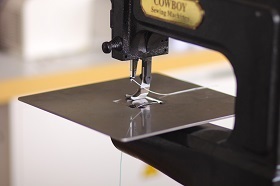 The Cowboy Outlaw is a handcranked (forward and backward), jump foot, needlefeed, leather sewing machine (it also sews nylon webbing and Bio-plastic). It has over 3/4 inch lift and sews over 5/8 inch thickness of real leather, with a maximum stitch length of about 3.3 stitches per inch. The bottom photo shows the Outlaw sewing 4 layers of 10oz (40 oz = 5/8") leather. The Outlaw uses bonded nylon or polyester thread sizes from #69 through #346 thread (and possibly #415). 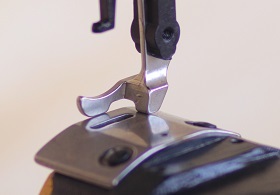 It is made of cast iron and steel, with a 9 inch long x 3.15 inch wide arm (similar to the motorized CB3500) and uses the same needles (794S), shuttle race and large bobbins as the larger Cowboy Stitchers. It also takes the same roller edge guide as it's larger brothers. 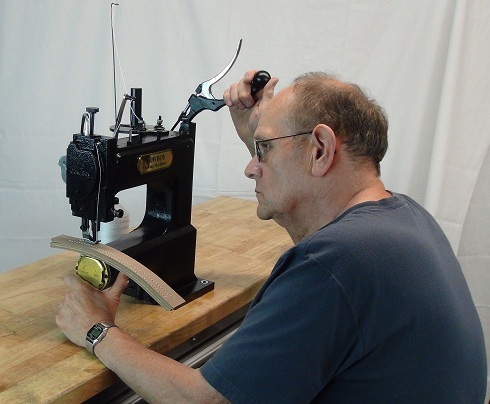 This machine sews from one stitch at a time up to 100 per min. 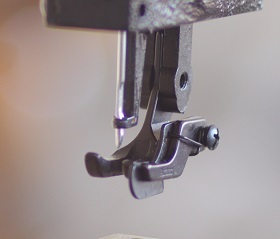 Built of solid cast-iron, instead of soft metal, it has all strong steel internal parts for years of trouble free sewing. Weighing in at 50Lbs, the Outlaw is portable enough to take to leather shows, to use it for tack and saddle repairs. Plus, it's great for sewing gun belts, handgun holsters and knife sheaths too! 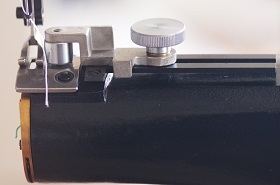 A full array of attachments are available for improving high productivity and perfect seam quality. 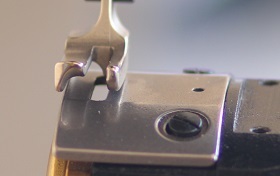 #CB01 Material Guide / Edge Guide: easy to make sure straight stitch. #CB02 Special flat work table platform: allows the cylinder arm sewing surface to be converted to a flat sewing surface to allow for better stitching with certain types of work.